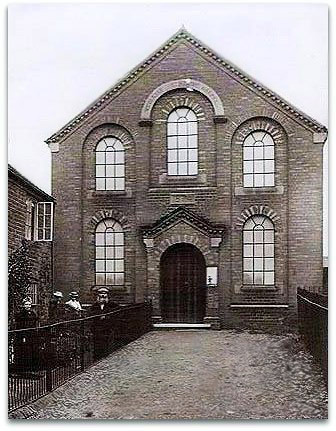 It is said that services used to be held in the up-stairs rooms of houses in the village before land was sought and the Wesleyan Mapperley Methodist Chapel was built in 1874. There were six long- seats each side of the church and extra ones /for the choir, and there were also communion chairs and a table, which are in the present church building on High Lane West and an old pedal organ which was used for many years. Upstairs was an extra room which could be used as a balcony for services but was also screened off for a Sunday School room.' and was the meeting place for youngsters in the village on a Saturday night. Mrs Florence Cooke, aged 78, who lives at The Limes, Mapperley, used to live next door to the chapel in the old cottage and has been a member of the church all her life. She is a trustee of the church and remembers the early life very well. 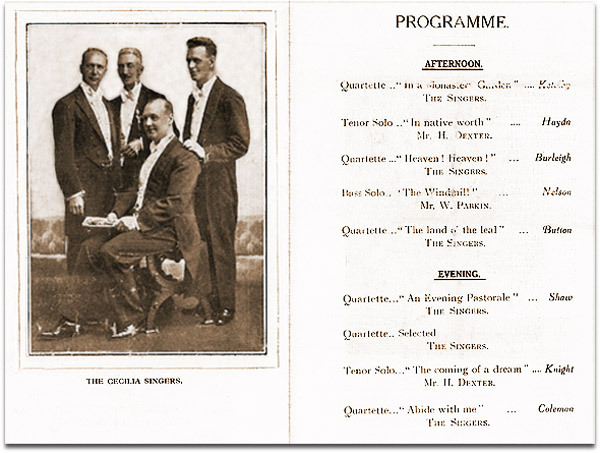 "During the 1920s we started what we called a "Good Friday effort" in aid of aged lay preachers' seaside homes," said Mrs Cooke. "People from all over the district would walk down to the village and we would all have a picnic tea." The tradition has continued to this day. It has always been very much a family church. Mrs Cooke said stalwarts included the Fletchers from Head House Farm, the Stephens, who lived at The Brook, and her own grandfather was one of the early members. By the late sixties numbers had fallen dramatically through lack of interest and there was only a handful of people still attending, most of whom were women. "Mr Charles Bowley, who was Sunday School superintendent, always said he wanted a chapel at West Hallam and Maurice and Hilda Stephens said they would give us some, land on High Lane which used to be a pottery yard." The old building was bought by Mr Ivan Webster for £800 and he has used it as a timber store ever since. The last service at Mapperley was conducted by Ilkeston Methodist lay preacher Mr John Moorley. Mr Webster wanted to take over the building immediately, so from August, 1969, until December, when the new £4,500 building was opened near Mapperley crossroads, services were held in the summer house of Ilkeston solicitor Mr Herbert Brewer at 137 High Lane West. At the dedication service conducted by the Rev Arthur Snell, then the Superintendent Minister of the Ilkeston Methodist Circuit, the church's oldest member, the late Mrs Hannah Bridges, 84 at the time, was presented with the key to the church by William Wood Ltd. from Heanor, who did the building. The building, however, is only a temporary one and within the next few years a permanent brick building must be built or the Methodists will have to think again about a home. Services on a Sunday are always in the evening except on the fourth Sunday in every month when there is an extra family service in the morning. Sunday School, under the leadership of Mrs Valerie Baker and teachers Mrs Margaret Morton and Mrs Ann Wathey, meets on Sunday mornings. On Tuesday nights the Men's Fellowship led by Mr Jack Parkinson, also a lay preacher, meets in the church, and on Wednesday evenings it is the turn of Mrs Barbara Hart's Women's Fellowship. The other evening meeting is the relatively new Brownie pack led by Brown Owl Mrs Linda Grebby on Fridays. Other Important positions in the church are held by Mrs J East, chapel steward and treasurer; Mrs Betty Trusell, secretary, and Mrs Connie Cresswell, Mrs Hilda Stephens and Mrs Ida Horsley look after the building itself and the land round it. The organist is Mrs Kathleen Burton. Superintendent Minister of the Ilkeston circuit is the Rev Brian Dams, but West Hallam has its , own minister, Pastor Cyril Mills, who took over "The Triangle" of West Hallam, Stanley and, Smalley Common Methodist Churches in November. 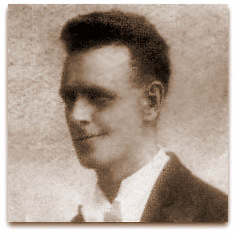 A strong advocate of Christian Unity, Mr Mills, who lives at The Manse, Kenilworth Drive, Kirk Hallam, trained for the Methodist ministry from 1949 to 1951 and served for two years in British Honduras where he was ordained. He returned to England and spent two years in the Belper circuit and resigned from the ministry in 1956. Since then he taught at St Thomas RC Primary School, when he temporarily became a Catholic, Stanton Vale School, and spent two years with the Church of England Children's Society. He now teaches at Arnold and Carlton College of Further Education in a scheme run by the Manpower Services Commission. For Mr Mills it is not a full-time ministry, for he spends two days a week in pastoral work and three Sundays preaching, but he is deeply involved with The Triangle. "I like the idea of all three communities working together and there is still a need to become even closer," said Mr Mills. 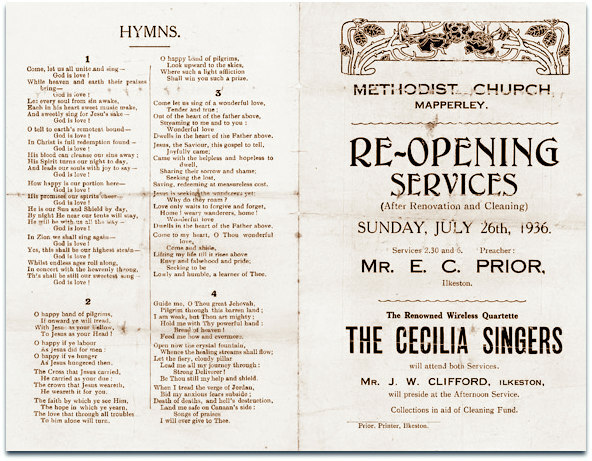 Tenders to build the new Chapel were sought on 10th September 1874 as advert­ised in the Ilkeston Pioneer: "Tenders are invited for the erection of a Wesleyan Chapel, in Mapperley. The plans and specification may be seen, and form of tender obtained. On application to Mr Charles Woolliscroft, Draper, Bath Street, Ilkeston". R. Argile Jun. Architect Ripley Derbyshire. Building commenced at a rapid rate because the memorial stones for the new Chapel were laid on Monday October 19th 1874. The task was performed by J. Howitt, Esq., the Right Worshipful the Mayor of Nottingham, and William Smith, Esq. 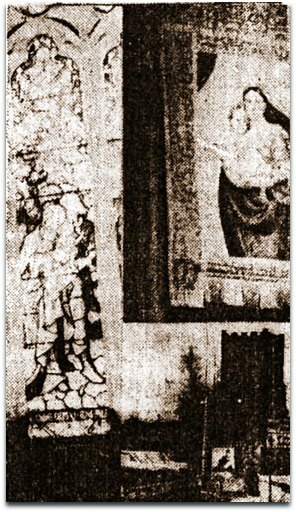 of Langley Mill; The Rev R. Brown, Chair of the District, and the Revs K. D. Webb and A. Doel, Circuit Ministers. A 4 o'clock Tea Meeting followed the ceremony. Tickets for the event were one shilling (5p) each. Eight months later, on Tuesday June 8th 1875 the building was dedicated by the Rev. B. Gregory of London. He preached at an afternoon 2-30 service and a 7-00 evening service. A large tent was erected for the event with tea arranged for 4 o'clock. 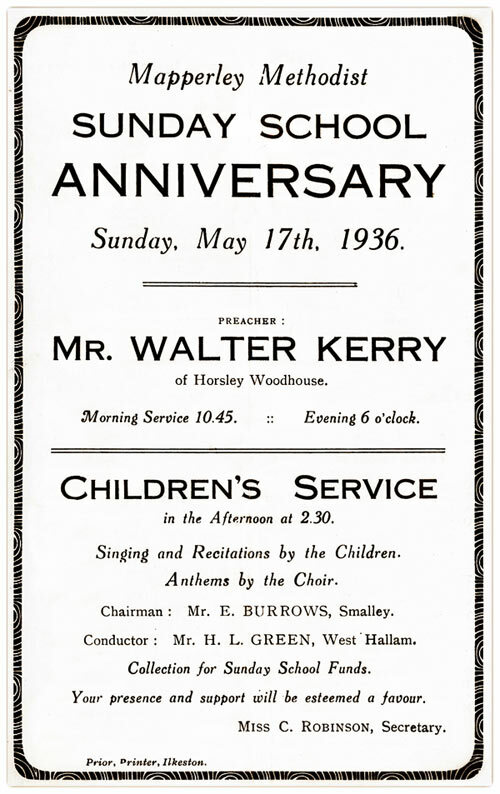 Collections were taken at each service in aid of the Building Fund. The building still stands but was converted to a private house several years ago. A tea meeting was held on Good Friday in a large barn kindly lent for the occasion by Mr Pounder. The object of the meeting to promote the erection of a new Wesleyan Chapel. A large number of friends gathered to show their sympathy for the movement. Upwards of 400 sitting down to enjoy the social cup. 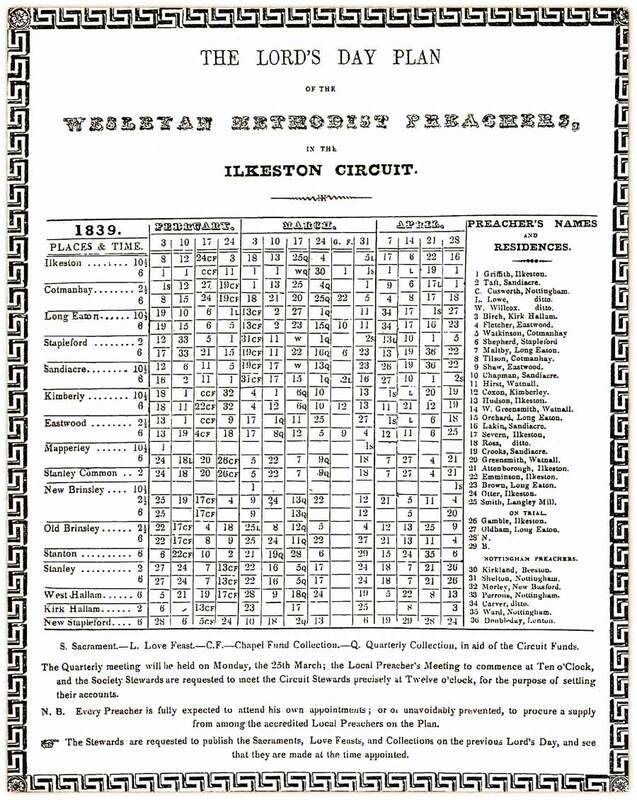 After tea the chair was ably occupied by the Rev E D Webb (Superintendent minister) Addresses were delivered by several local preachers and others. The whole of the trays being given the entire receipts (over £20) will go towards the proposed new chapel. At the close of the meeting promises amounting to over £100 were announced. October 15th 1874 - The foundation stones of the chapel are to be laid on Monday next by the Worshipful the Mayor of Nottingham ( J Howitt Esq) and W Smith of Langley Mill. "tenders are invited for the erection of a wesleyan chapel, in mapperley. plans and specification may be seen, form tender obtained. on application to mr charles woolliscroft, draper, bath street, ilkeston". Building commenced at a rapid rate because the memorial stones for the new Chapel were laid on Monday October 19th 1874. The task was performed by J. Howitt, Esq. The Right Worshipful the Mayor of Nottingham, and William Smith, Esq. of Langley Mill. The Rev. R. Brown Chair of the District, and the Revs K. D. Webb and A. Doel Circuit Ministers. A 4 o'clock Tea Meeting followed the ceremony. Tickets for the event were one shilling each. Eight months later on Tuesday June 8th 1875 the building was dedicated by the Rev. B. Gregory of London. He preached at an afternoon 2-30pm service and a 7-00pm evening service. A large tent was erected for the event with tea arranged for 4 o' clock. Collections were taken at each service in aid of the Building Fund. Stalwarts included The Fletchers of Head House Farm and The Stephens of Mapperley Brook. Falling attendances led to its closure on Sunday 17th August 1969. A new chapel was opened at Mapperley Crossroads, West Hallam. 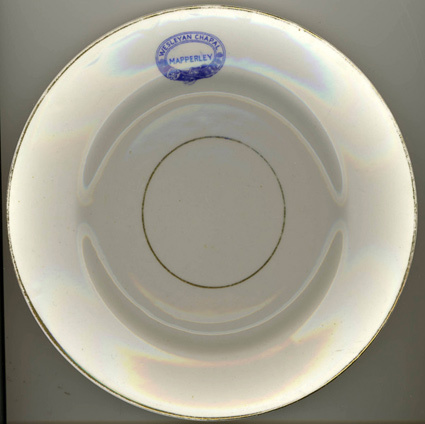 Very few items of the crockery remain today but are much sought after by collectors. The chapel produced a set of crockery for the kitchen. 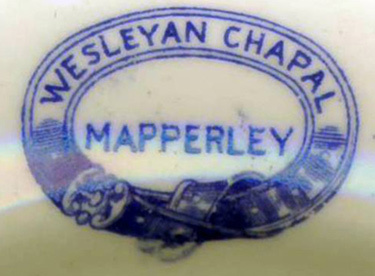 Each item was marked with the "Mapperley Wesleyan Chapel" logo. Unfortunately chapel has been spelt as CHAPAL. 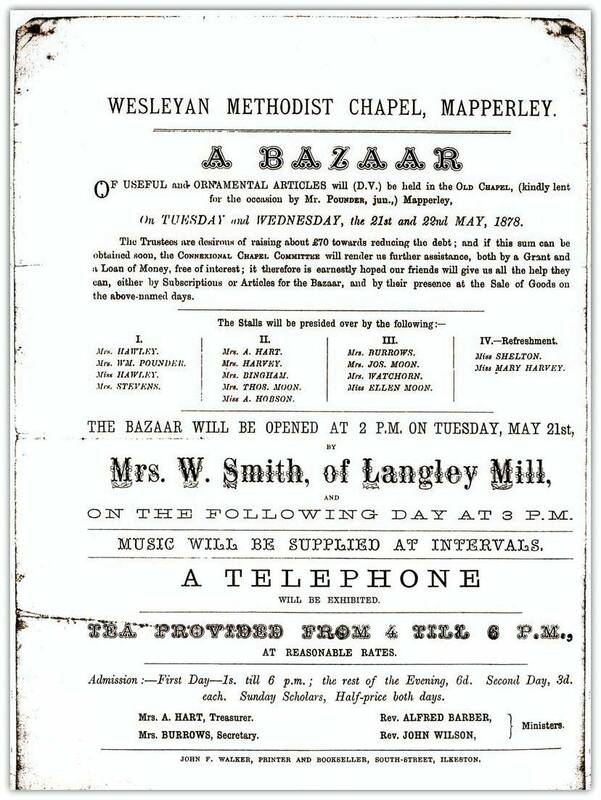 Mapperley Chapel was sold for £800 to Ivan Webster who used it as a joinery workshop and store. 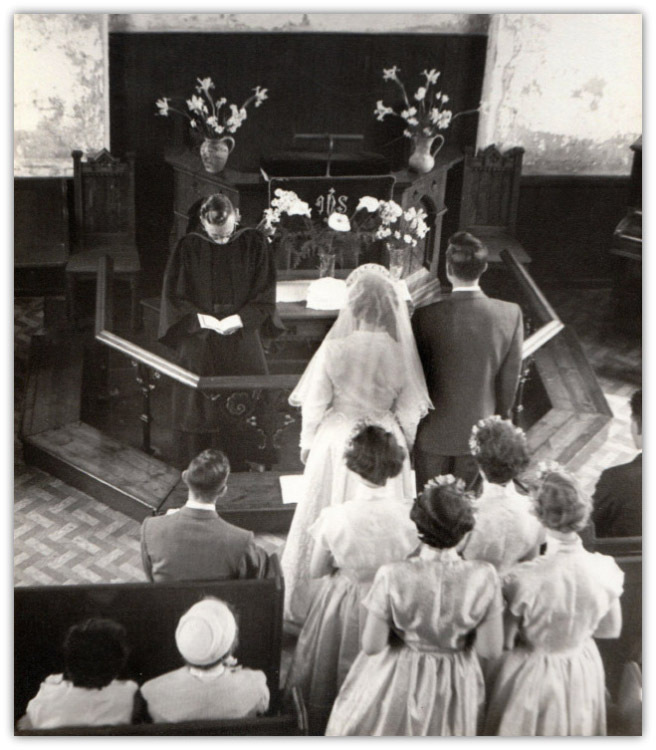 The chapel was sold in 1988 and converted to a private dwelling. The chapel is a highly colourful building, with different coloured bricks creating the curved lintels over the large, arched windows and doorway. A decorative ridge of brickwork runs along under the eaves line to the side and the front of the building. Large floor to ceiling arched windows run along the side of the building, styled the same as those at the front. The roof is slate. Two chimneys can be seen to the front of the building - one either side, showing that heat was once provided within the building. Methodist church re-opening services. Sunday July 26th, 1936.